Chola is an Indian street food popular over centuries. Not to be confused with the Monarchs in India centuries ago who were also called Cholas; this food is prepared in many variations. A purely vegeterian dish, the base is always of chickpeas (commonly referred to as chola or channa); they are mixed with finely chopped tomatoes, onions, green chillies and corriander leaves. It is not complete without adding condiments to make it tangy with a hint of sweet and a tad spicy. This is in the form of a tamarind and date chutney, perhaps a squeeze of lemon and a spice mix called Chaat Masala. I love to add fresh mango and boiled potato cubes to add to the texture and flavour. Here is my recipe I share, its best to taste as you go along to help you keep it best suited to your palate. In a large bowl toss together the chickpeas, onions, corriander, mint, tomato, mangoes, potatoes and green chillies. Sprinkle the salt and red chillie powder all over. When ready to serve, dress it with the chutney, the chaat masala, yogurt and sugar. Lastly add the crisp puri in broken pieces. Alternately serve the chola on top of the puris individually. Boil and peel the potato before cutting it. Buy ready cooked chickpeas in cans, but rinse them thoroughly before using them. If you cannot find mangoes locally add a tsp or two of dry mango powder called Amchur instead. Mint always adds to the freshness but is not an integral part of the dish. Before serving taste that the balance of spice, sweet and sour is perfectly balanced to your palate. 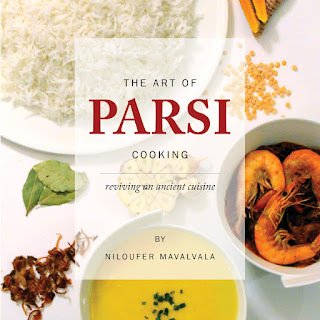 For recipes, history and origins on Parsi Food my cookbook The Art of Parsi Cooking; reviving an ancient cuisine is available.